There's nothing quite like sitting out on your patio in the evening, enjoying a cool breeze and a beautiful sunset while relaxing on comfortable, stylish furniture. Whether your style tends towards the super-casual, like hammocks and Adirondack chairs, or you prefer a sleek, modern look, having the right outdoor furniture can make all the difference between an unused patio or backyard and your own personal relaxation-and-entertainment zone. What should you buy for your outdoor furniture? Naturally, the answer depends on what you have in mind. Are you looking for chaise lounges to put next to your pool, or a patio set for serving cocktails and appetizers? Outdoor furniture isn't limited just to seating: most retailers also carry chimineas and fire pit tables both for ambience and heating purposes, shades and curtains for privacy and protection from the sun, even swings just for the fun of it. If you're looking for the best selection of outdoor furniture, all with free shipping and a price-match guarantee, DFOhome should be your top shopping destination. This North Carolina-based retailer focuses solely on making your outdoor space a reflection of your personality. With an excellent reputation and an A+ rating with the Better Business Bureau, DFOhome is our top choice for Outdoor Furniture. As a one-stop shop for all of your home improvement goals, Homeclick carries a broad selection of outdoor furniture and more, from bath and shower fixtures to appliances and lighting. With free shipping on most orders over $99, no restocking fees, and an A+ rating with the Better Business Bureau, Homeclick is a trusted retailer for your outdoor furniture needs. Have an eye for design - or feel hopelessly lost when it comes to knowing what would perfectly fit your outdoor space? Either way, RST Brands can help. Their visually-appealing site showcases the hottest trends in outdoor furniture and decor, and free consultations with their design team make it a breeze to find exactly what you need. Add free shipping and a great reputation with the BBB, and you've got a retailer you'll love in RST Brands. As you think about what you need to make your ideal outdoor space, you'll want to give some consideration to what materials are used. By design, most outdoor furniture is designed to be weather-resistant, but some materials can withstand heat, cold, rain and snow easily, while others will need to be moved indoors during times of more extreme temperatures. Selection. Does the store have a wide variety of products to choose from? Can you get items in a number of colors, materials, and styles? How many brands does the retailer carry in stock? Price. Are the prices competitive with other stores? Are there any discounts or other money-saving perks like free shipping? Will the store match the price if you find your furniture somewhere else for less? Return Policy. If you need to return your purchase, will the store allow it? And, if so, will you be charged a restocking fee? Customer Satisfaction. How does the store measure up when it comes to keeping their shoppers happy? Is the customer service department responsive and helpful when issues arise with products or delivery? 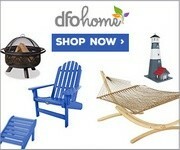 TopConsumerReviews.com has reviewed and ranked the best Outdoor Furniture retailers available today. We hope these reviews help you find the right outdoor furnishings to make your space perfect!